The eastern province of Chanthaburi doesn’t feature on the itinerary of many overseas tourists. Instead, many will speed through here on their way to Trat, Ko Chang or Cambodia, but the city of Chanthaburi makes for an interesting place to stop-over and enjoy the quiet charm of the area. The name Chanthaburi translates as ‘Moon City’. In Western culture, there are folklore tales about the man in the moon, but in Thai folklore it is a rabbit who lives in the moon. The official provincial seal of Chanthaburi features the moon and a rabbit, and walking around town you will also see rabbit emblems on street signs and on shop-fronts. 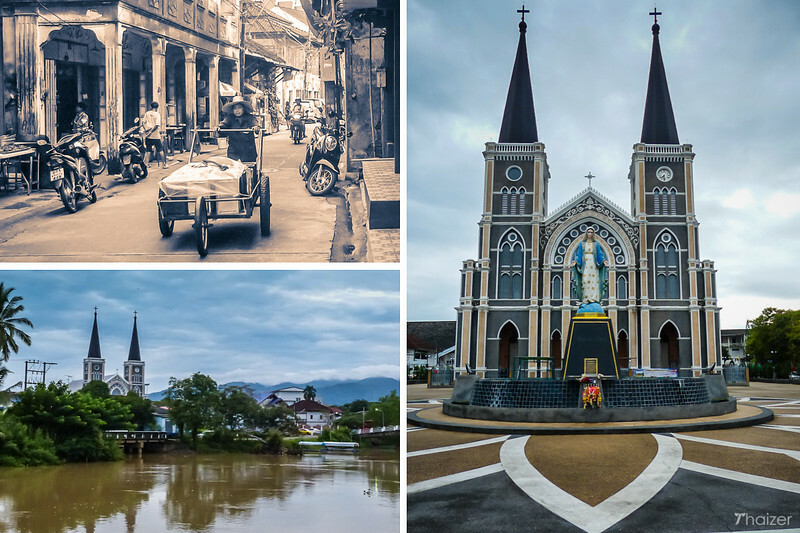 The most prominent landmark in Chanthaburi is the Cathedral of the Immaculate Conception. On the other side of the Chanthaburi River along Sukhaphiban Road is the historic Chantaboon Waterfront area with plenty of interesting architecture, old shop-houses and local character. Taking a walk a little further south brings you to the gemstone market area. Chanthaburi is famous in Thailand for its weekend gem and jewellery market which attracts traders from around the world. Many migrants from Vietnam set up new homes in Chanthaburi after fleeing religious persecution in the 19th century. Other Vietnamese migrants made a similar journey in the 1920s to escape French colonial rule and again in the 1970s in the aftermath of the war in Vietnam. Chanthaburi is proud of its association with King Taksin the Great and there are two important monuments in the city in his honour. The King Taksin Shrine outside the naval base is easy to spot with the building topped by a representation of the king’s distinctive royal hat. Another statue is located in the King Taksin the Great Park, a pleasant recreation area with a lake and a surprisingly well-equipped outdoor gym. Following a dispute between Siam and France, French forces occupied Chanthaburi in 1893 and remained in control for more than a decade. Chanthaburi is sometimes referred to as the ‘Land of Fruits’ or the ‘Orchard of Thailand’ by Thai people for the abundance of fruits the province produces. If you look closely at the street signs in Chanthaburi, you’ll notice that they not only feature the rabbit emblem but also a variety of fruits including durian. Chanton Pacahna restaurant close to the Kasemsarn Hotel features the ‘king of fruits’ in its signature dish of massaman curry with durian used in the recipe instead of potato. Along Sukhaphiban Road there are plenty of excellent coffee shops, noodle shops and restaurants a number of which of which have verandahs with river views. Chanthaburi is approximately 250km south-east of Bangkok. A frequent bus service departs from Ekamai Bus terminal although the journey can take a slow 5.5 hours to cover the distance with prices around 200 Baht. There are also regular services between Chanthaburi and Pattaya (180km) and Trat (70km).